Restaurants and foodservice chains in several parts of the world continue to face shortage of meat against the rampant consumption. This has turned them towards keeping large amounts of frozen meat in stocks. Consumers are stacking their refrigerators with frozen meat products to cater to the changing requirements in the household consumption. While the demand for frozen meat products continues to gain traction vigorously, meeting these demands is becoming a great challenge for companies. Producing frozen meat items at large scale is a food processing challenge which entails high expenditure on the operations and maintenance of huge machineries. Moreover, key players in the global frozen meat market are compelled to follow strict compliance to quality standards and production safety. Such factors and several others will continue to influence the growth of the global frozen meat market in the foreseeable future. 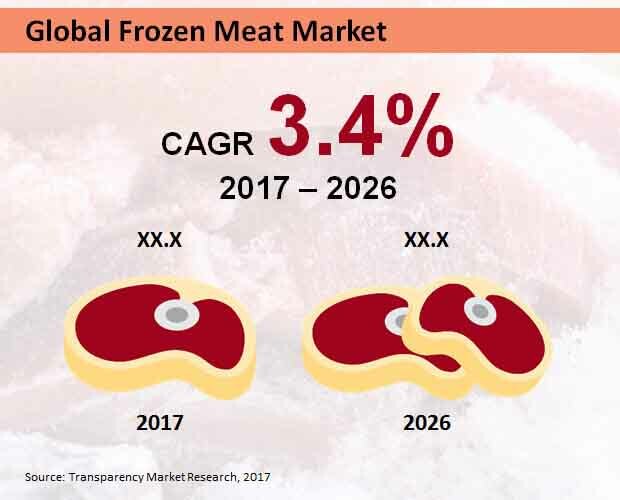 According to Transparency Market Research’s forecast study, the global frozen meat market will register a sluggish expansion at a CAGR of 3.4% during the forecast period, 2017-2026. The report further projects that more than US$ 30 Bn worth of frozen meat products will be sold globally by the end of 2026. From complexities in supply chain to emergence of new processing and refrigeration techniques, a slew of factors are expected to influence the dynamic growth of the global market for frozen meat over the forecast period. The report further reveals that Asia-Pacific excluding Japan (APEJ) region will amass highest revenues in the global frozen meat market. By the end of 2026, the APEJ frozen meat market will touch US$ 9.3 Bn in terms of value. The report has observed that the demand for frozen beef will reach new highs through every passing year in the forecast period. In 2017, more than US$ 7.1 Bn worth of frozen beef products were sold in the global frozen meat market. This number is expected to rise robustly, and bring in more than 30% of overall revenues throughout the forecast period. In addition, frozen chicken products are pegged to register a CAGR of 3.5%, while frozen pork products will incur fastest sales through 2026. In the near future, consumers will remain more inclined towards consuming frozen red meat products for being rich source of high quality proteins and amino acids. The largest end-use of frozen meat products will remain concentered among the food chain services in the global market. The global frozen meat market will witness highest share of revenues emanating from food chain services in the world. In addition, modern trade outlets will also register a considerable uptick in the end-use of frozen meat products. A key finding from the report reveals that online stores are likely to register fastest end-use of frozen meat, exhibiting revenue growth at a steady CAGR of 5.1%. Leading manufacturers of frozen meat products have been profiled in the report to deliver detailed competition assessment. Marfrig Group., Kerry Group Plc., BRF S.A., Associated British Foods Plc., Pilgrim’s Pride Corporation, Tyson Foods, Inc., Verde Farms, LLC, and Arcadian Organic & Natural Meat Co. are expected to lead the market in terms of production, and play instrumental roles in the global frozen meat market expansion through 2026.